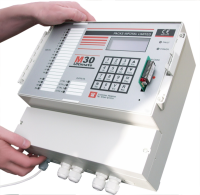 The M30 PSTN Auto-Dialer is a purpose built industrial unit, designed to connect to any device that provides a NO/NC (Normally Open/Normally Closed) alarm contact E.g. Thermostats, Mains failure detectors, Building Management systems, Fan panels or High/Low water detectors etc. You can also use analogue inputs via the optional interface. The M30 primarily uses the PSTN network to communicate user recordable voice messages direct to the correct on call personal, because it uses the PSTN network you don’t need to worry about the mobile networks getting clogged during busy periods or the reception dropping out. The M30 was created with customisability in mind, so if you want your unit to work in a certain way or have a special feature unique to your application we will normally be able to create it for you. The M30 is used around world by a variety of businesses in a multitude of situations from Horticulture in Wales, Hotels & Hospitals in London, Power stations in Scotland, Building management systems in Qatar, desalination plants in Florida and railways in Hong Kong. 4,8,16,32 & 56 separate inputs. Real user recordable voice messages. 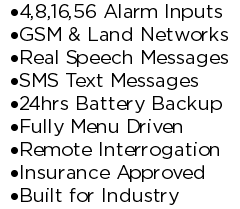 Ability to upgrade to SMS or GSM voice calls. For more information on our PSTN Auto-dialer , help or pricing please Contact US or visit our Standard Features or FAQs pages.